On one of our first days here at the University of Auckland (NZ) we had a Maori welcome: a haka (war dance) and a Maori greeting us in Maori. It more or less sounded like “hakamuto…”, a string of just a few sounds. 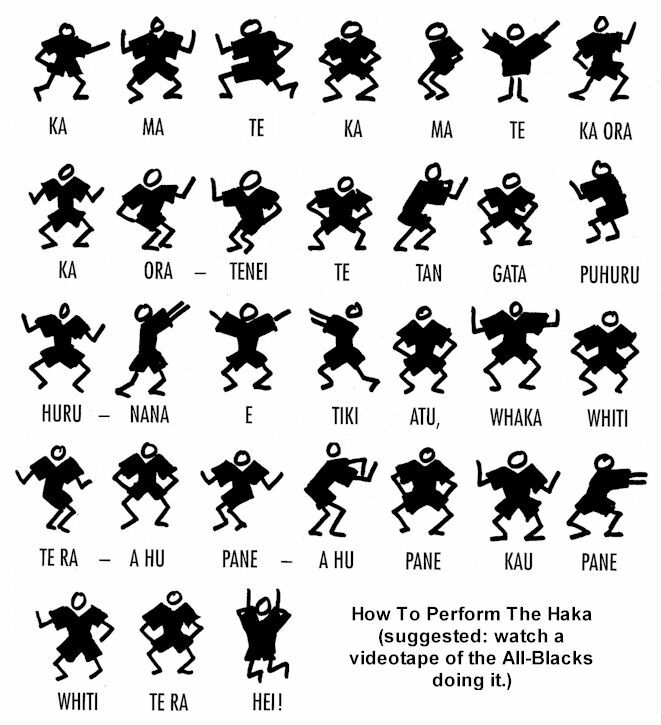 Indeed, Maori, an Eastern Polynesian language, has only 10 consonants: h, k, m, n, p, r (rolled), t, w, ng (velar nasal), wh (pronounced as f), and 5 vowels (vowel length is phonemic): a, e, i, o. u. At the end of the 19th century, Maori became a minority language. Fewer people spoke and learnt to speak the language. Only at the end of the 20th century, the dangers of the language loss were recognised and recovery programmes were initiated, and Maori became New Zealand’s second official language in 1987. After a brief revival, however, the language has seen another decline in speakers – only about 9% of the Maori population is fluent in the language (about 4% of the population). Maori words have their place within Kiwi-English. Many place names have not been translated into English and tell of the landscape’s properties, for example ‘Aotearoa’ means ‘cloud white long’ (land of the long white cloud, the Maori name for New Zealand). More examples can be found here. Kiwi-English is similar to Australian English. What I notice most is the shift from ‘e’ to ‘i’. Further differences are that the short ‘i’ has centralised towards schwa, and the short ‘a’ sound has moved towards the short ‘e’. I was a bit scared I wouldn’t understand a thing, but I haven’t had any troubles yet. So much for the linguistic side of down down under. I’ve been here for a week now, lectures start tomorrow, so there’ll be more to tell soon. This entry was posted on 15/07/2012 by G in Academia, Cultures, Linguistic Musings and tagged exchange, Kiwi, Maori, New Zealand.